Eastern Iowa will soon be home to a new tourist destination: Lake Delhi in Delaware County. 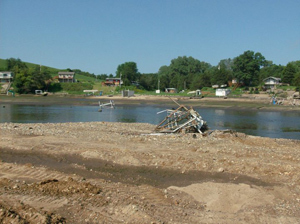 The recreation spot vanished nearly 4 years ago, when the dam failed after torrential rains, draining the 9-mile long lake. A ground breaking ceremony will be held at noon today signaling the end of a long struggle to rebuild the facility. Steve Leonard helped lead the way for Lake Delhi’s comeback. “Our community has waited a long time for this day,” Leonard says. The $16 million project includes more public access to the lake, which had previously only been accessible to those who owned property around the lake. “We will be adding an additional boat ramp, additional parking areas, additional restrooms, and an additional beach, all in addition to the boat ramps and beaches we already had,” Leonard says. Nearly one third of the money for the project is coming from the State of Iowa. If all goes well, Lake Delhi could be back in business sometime next summer. Leonard expects the rebuilding of the dam and the refilling of the lake will provide a major boost to the local economy, which has suffered since the disaster in July 2010. “We know that many folks have been talking about adding additional restaurants or retail facilities in and around the area,” Leonard says.